Considering that it’s something I’ve been doing since the age of 15, I’m a bit embarrassed to come to the realisation that I know practically nothing about the actual process of hair colouring. I started going grey when I was 17 and I’ve now reached the point where unless I’m happy to embrace a more natural look (I’m not), I need to dye my hair every 6-8 weeks. Thankfully, home hair dye technology has reached a stage where it’s pretty darn fantastic. We can all go to our local chemist and pick up Salon quality products to take home with us at a fraction of the price. Tints of Nature, based in the New Forest are a local brand to me. Well, compared to many brands, they’re local to all of us as their products are manufactured within the UK. Their niche is in the natural hair market where they provide colourants, shampoos and treatments designed to be as gentle on your hair as possible. 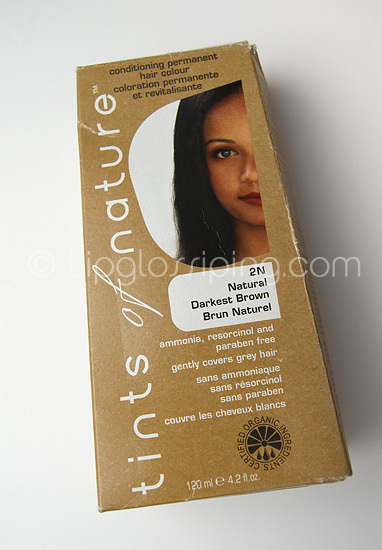 The colourants contain no ammonia, sulfates or resorcinol and are paraben free. Divided into two clear groups: The Natural Colours & The Fashion Colours, both offer permanent coverage. Sadly, only the Natural Colours are recommended for covering grey hair which for someone like me, rules out the more adventurous shades as I cannot compromise on complete coverage. I was sent a pack of the Natural Colour permanent dye in shade 2N Natural Darkest Brown for review consideration and I was curious to see how well it would blend with the colour already present once my roots got to that “Oh my god, you ARE NOT leaving the house looking like that” stage. Perhaps not the most stylish or eye-catching packaging design, what the product lacks in kerb appeal it makes up for in eco-credentials as all components are recycled and recyclable. You apply as you would any other dye, so it thankfully wasn’t too much for my puny brain to cope with on a Monday evening. The results were good, natural and all grey was covered well as promised. I’m not the neatest home hair-dyer in the world and one thing this product excelled at was the oh-so-important “will it come off your ear lobes” test! It was also less fumey than my usual Superdrug dye. At £8.99 a pack, it’s also heading towards being twice the price of my regular product. I think it’s something I would make the effort to pick up whenever I felt that my hair needed a break from the harsher products on the market. Do you ever get hair dyers guilt? When you know that your ends are feeling a bit frazzled but you HAVE to fix those roots? This is when I’d call on the Tints of Nature range to help me out of a jam. Tints of Nature products are available to buy online and in certain stockists. Check the website for details. can you recommend a good semi perm dye that covers grey at all? I shall also attempt to put this on your fab new forum! Just to let you know that the natural shades in Tints of Nature can be mixed with the fashion shades, so that you get grey coverage without compromising on the tones you wish to achieve. I was also looking for something along the line, I used ecocolors, I really love the results, the color is very natural and blends perfectly with my real hair color! My hair is very shiny and healthy looking, you can tell the difference right after coloring. Also they helped me formulate the color, I don’t think I could have found the exact color right away without their advice.